OXFORD, Miss. 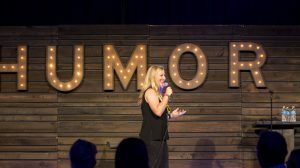 – University of Mississippi alumna Kendall Ketchum has performed her comedy routines for a decade in New York City, but she’s recently taken her talent from dive bars to a tour with former “Saturday Night Live” cast member Darrell Hammond. Ketchum, who studied theatre arts at Ole Miss, earned her bachelor’s degree in 2006 and moved to New York shortly after, intent on breaking into comedy. For a girl from Yazoo City, the cultural transition was not as difficult as one might think, thanks to a close network of other Ole Miss graduates. She immediately tried her hand at stand-up comedy. Ketchum took a break from stand-up to join the Upright Citizens Brigade, an improv group and training ground for comedians that once included such heavyweights as Amy Poehler. About five years ago after regaining her footing through improv, Ketchum began doing stand-up again. She performed successfully at big-name venues such as Gotham Comedy Club and Caroline’s on Broadway, which eventually became her home base. The focus of Ketchum’s comedy is not jokes, but storytelling. She is known for her brand of Mississippi-meets-New York humor as she describes cultural differences and how each handles different situations. Ketchum met Hammond while she was preparing new material for a show at Caroline’s. The two ended up talking about New York delis and other random topics when he asked her to watch the show with him. She did, and they sat and whispered about different styles of comedy, including her own unique style. Just a few days later, she received a call from Hammond, who had gotten her information from someone at Caroline’s. The two began touring in September and have been working together since. Ketchum has performed with Hammond in Del Mar and San Francisco, California; Jacksonville, Florida; Charlotte, North Carolina; Salt Lake City; and Tempe, Arizona. Ketchum said Hammond, who has a similar comedic style of storytelling, helps her with writing and ideas. Ketchum said she is excited to have gotten a break after years of hard work and, sometimes, frustration.